For tourists trying to escape chillier northern climes, Andalucia (or Andalusia) is the answer to their prayers, with mild winters and springs, together with hot summers. 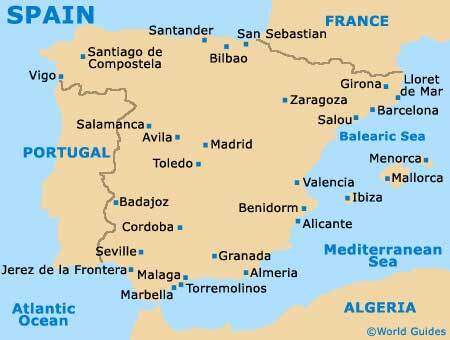 It is little wonder that the region has become one of Spain's top tourist destinations. Inland, Andalucia is Spanish through and through, with its towns and villages remarkably close to the image that most people have of Spain, complete with sherry-sipping, castanet-clicking locals. On the coast, however, it is an entirely different matter. The millions of tourists who come here in search of the sun have, over the years, transformed what were once unassuming fishing villages into major seaside resorts. The three main tourist cities in Andalucia - Cordoba, Seville (Sevilla) and Granada, are positively bursting with Moorish monuments, vivid reminders of Spain's conquest by these part-Berber, part-Arabian people. Granada's Alhambra Palace dazzles, the capital Seville's Gothic cathedral is as grand as they come, and Cordoba's 1,200 year-old mosque, know as the Mezquita, is one of the best in the country. Away from Andalucia's main tourist trail, there are plenty more fascinating towns that are worth exploring, including Ubeda, with its Renaissance-style palaces and churches, and Ronda, home to the most historic bullfighting ring in the whole of Spain. The latter is especially popular with day tripping visitors from the nearby Costa del Sol. You don't get any bigger and brassier than the Costa del Sol. Extending from the busy airport town of Malaga to Torremolinos, Marbella and Estepona, it is one of the most heavily developed stretches of coastline in Spain, almost completely covered in modern hotel complexes. Once known as the 'Costa del Crime' because of its popularity as a retreat for those in trouble with the law, today it attracts a mix of the wealthy and families in search of a bit of sun. If the Costa del Sol isn't your sort of thing, head west to the beaches around Cadiz. The beaches here are noticeably quieter and the coastal towns and villages have more of a Spanish feel. It may come as a surprise to find that Andalucia isn't just about Moorish history or sandy beaches. A fifth of the region is classed as an environmentally protected area. As well as having two national parks, the region also boasts a couple of dozen natural parks. The Sierra Nevada National Park in Granada is the largest in Spain. It is also home to the most southerly ski resort in Europe. After the snow has melted, the mountains of the Sierra Nevada come alive with the sound of hikers, bird watchers and paragliders. The Andalucian city of Cordoba sits next to the Guadalquivir River, within the southern portion of Spain. Surrounded by spreading countryside and situated part-way between Granada and Seville, Cordoba is centred around the Plaza de las Tendillas, where the nearby historic Mezquita Cathedral is a crowd-pleaser. One of Spain's treasures, the city of Granada features a hilltop location and rich Moorish heritage. Home to the famous 13th-century La Alhambra and Generalife Gardens, Granada is close to the Sierra Nevada mountains. The main resort along Spain's famed Costa del Sol, Malaga offers a vast selection of beaches, many of which stand around the bay. Much of Malaga has recently be redeveloped, with numerous modern hotels along the coast. Marbella, on Spain's sunny Costa del Sol, is a popular tourist destination, with a coastline stretching for over 25 km / 16 miles. Sandy beaches, public squares and historic buildings are amongst the area's main attractions. Standing along the Costa del Sol, Torremolinos enjoys a breathtaking location, with an endless shoreline and many beaches. Resort highlights include a renovated old town area, a seafront promenade and inexpensive hotels.